Where and How Can the Public Provide Input on the General Plan Update? Who Is Providing Input on the General Plan Update? As directed by the Board of Supervisors and laid out in the General Plan Update’s scope of work, the General Plan Update will be advised primarily by the Ventura County Planning Commission and receive additional technical assistance from technical experts in additional groups. As the primary advisory body for the General Plan Update, the Planning Commission will review public draft reports and public input as well as provide direction to County staff and consultants. The General Plan Update is currently scheduled to meet with the Planning Commission at least 16 times throughout the course of the project. 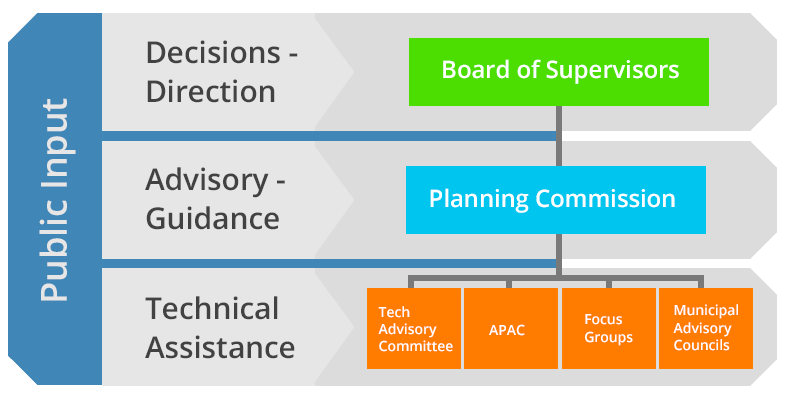 Technical expertise will be gathered from four primary channels throughout the General Plan Update by forming and consulting with a Technical Advisory Committee and seven Focus Groups as well as seeking input and engaging with the County’s Agricultural Policy Advisory Committee and six Municipal Advisory Councils.